How does your own financial path compare to that of the average American? From opening your very first bank account to tapping into your 401(k) in retirement, life is full of financial rites of passage. As we grow older, we find new opportunities to invest in our futures, either by putting some cash away in savings or by taking on debt to fund our next big step. But whichever monetary benchmark is next on your list, you may wonder where you stand in comparison to your peers. After all, most of us are pretty private about all things fiscal, so it’s hard to know if you’re ahead of the crowd or falling far behind. And while there’s no such thing as a one-size-fits-all financial plan, it would be nice to learn when most folks hit the big benchmarks, if only to learn where we stand in comparison. 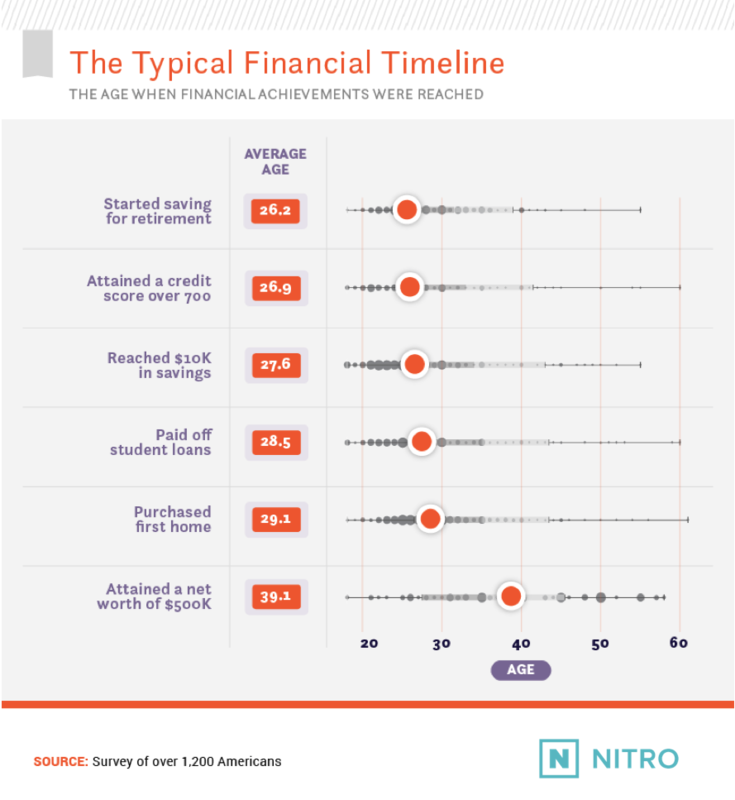 We asked over 1,200 Americans of various ages how old they were when they experienced major financial milestones, such as earning a strong credit score or buying a home of their own. We then averaged their responses to determine the typical American’s financial timeline and gauged how they felt when they checked each item off the list. Ready to see how your own money history matches up to that of the crowd? Let’s get started. We’ve all heard it said that it’s never too early to save for retirement – and most Americans seem to be listening. With an average age of just over 26 years, starting to save for retirement was the earliest accomplishment on our list, perhaps because many Americans are enrolled in savings plans automatically once they start working. Obtaining a credit score higher than 700 and reaching $10,000 in savings came next in our average age progression – encouraging proof that young people can repay debt responsibly while also putting some cash away. Buying a first home came a bit later, with an average age of 29.1 years. That figure resonates with recent research suggesting millennials are the nation’s largest homebuying demographic (talk about “adulting”). Those who amassed a personal wealth of $500,000 or more did so at an average age of almost 40, however, meaning millennials still have time to grow their fortunes. But if there’s any statistic that represents millennials’ aspirations most, it’s paying off student loans at the average age 28.5. Because so many Americans make this investment in their educations, we took a closer look at our participants’ student loan repayment and their associated emotions. Millennials were far more likely than baby boomers to have taken on student loans, perhaps because college prices have soared in recent decades. As one would hope, the percentage of borrowers who paid their loans back increased significantly between millennials and Gen Xers as well, from 18% to 31% respectively. But among members of each generation with outstanding loans to repay, many planned to be making payments well into the future. Millennials didn’t anticipate being loan-free until their mid-30s on average, while the average Gen Xer with outstanding loans planned to finish payments around age 50. 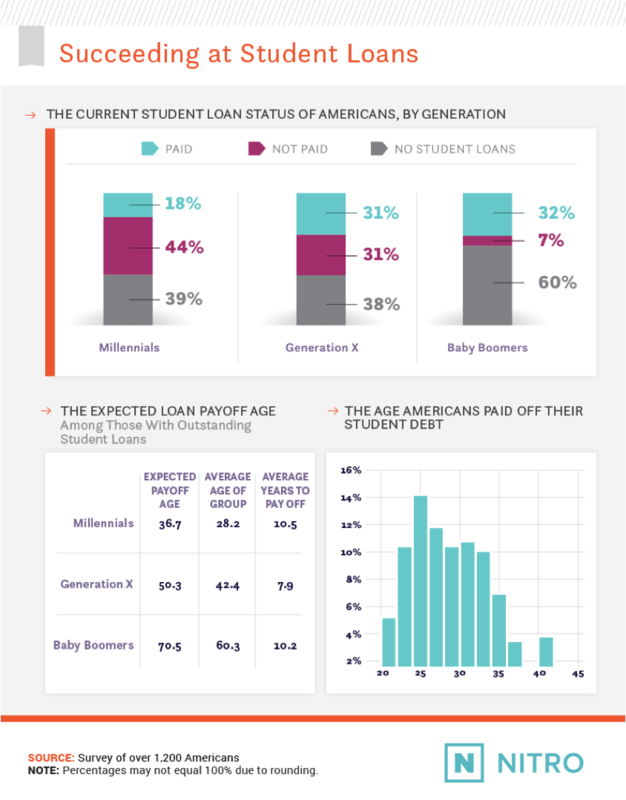 These projections put them well behind peers who have paid their loans already. Perhaps some of these respondents haven’t yet considered their refinancing or consolidation options, which might accelerate their repayment time frames. Whether paid off or still outstanding, student loans provoked some strong emotions in our respondents. Their feelings related to student debt at either stage also varied significantly by gender. 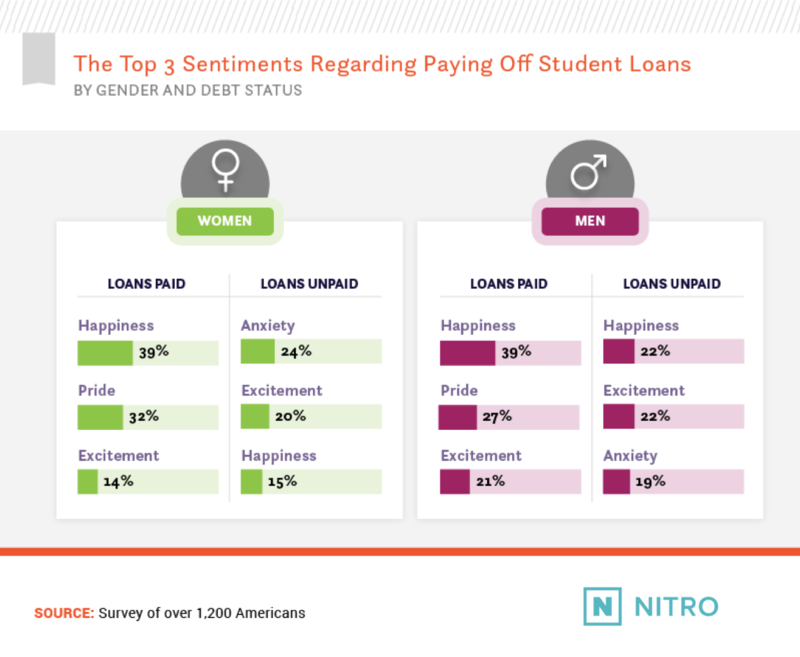 Among those who paid off their student loans, men were more likely to feel excitement whereas women expressed pride more frequently. Between both genders, however, the dominant feeling was happiness at their accomplishment – and understandably so. Anxiety emerged among those with unpaid loans, particularly for female respondents. Nearly a quarter of women with unpaid loans felt anxiety about their debt. This finding may relate to recent research suggesting female borrowers typically owe more than their male counterparts once they graduate. However, a fair share of respondents also expressed happiness or even excitement about their choice to take out loans. After all, educational investments can pay off significantly over time, and their emotions may reflect borrowed money well spent. Homeownership is the next big financial hurdle we’ll consider more closely, and the generational trend in our results is hard to ignore. Rates of homeownership were more than twice as high among Gen Xers as millennials, and 86% of the baby boomers owned a home. Some researchers suggest millennials are prioritizing paying down their student loans before jumping into the market for a home. That choice might explain why millennials didn’t expect to buy until roughly age 34 on average. Among those who had purchased a home, however, we found a concentration of buyers in their 20s and early 30s. Past that age, in fact, relatively few people bought a first home. 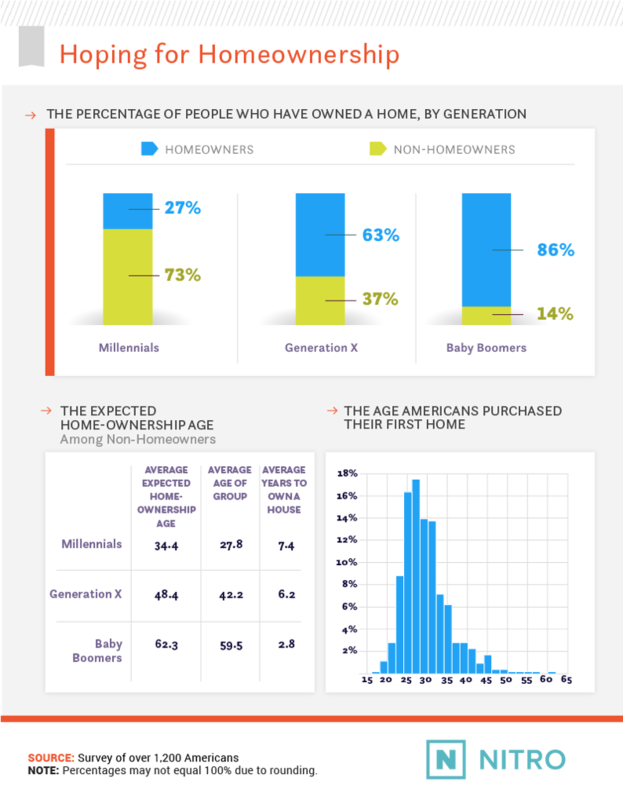 That doesn’t mean Gen Xers and baby boomers without one have given up on homeownership altogether, however. Gen Xers who hadn’t yet owned a home anticipated buying a place at about age 48 on average, while non-homeowner baby boomers projected purchasing at roughly 62, perhaps in time to retire. Men and women had substantially different feelings about owning a home, whether they had one already or looked forward to buying one in the future. 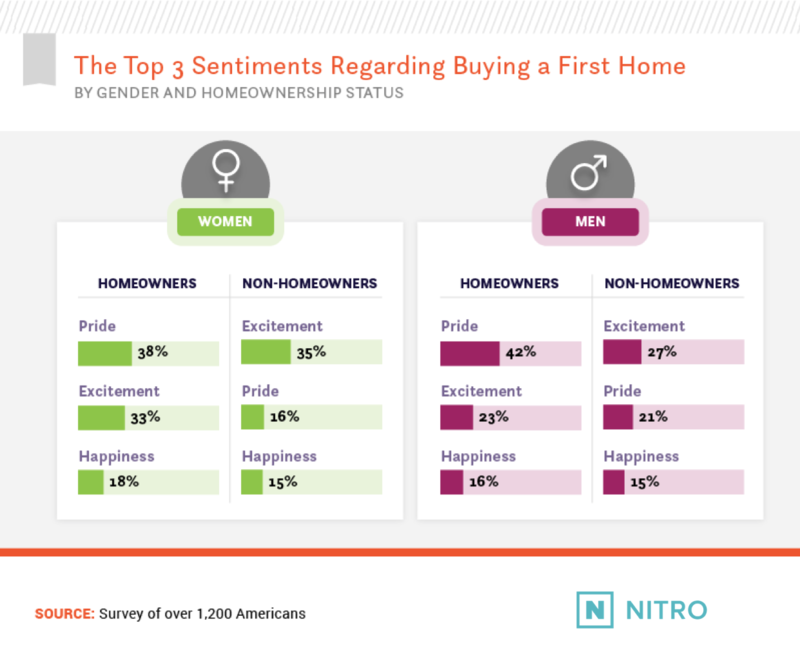 Female homeowners felt more excited about a place to call their own, although men expressed pride in their homes more often. Female respondents who didn’t own a home continued this trend, expressing excitement about buying one more often than men did. 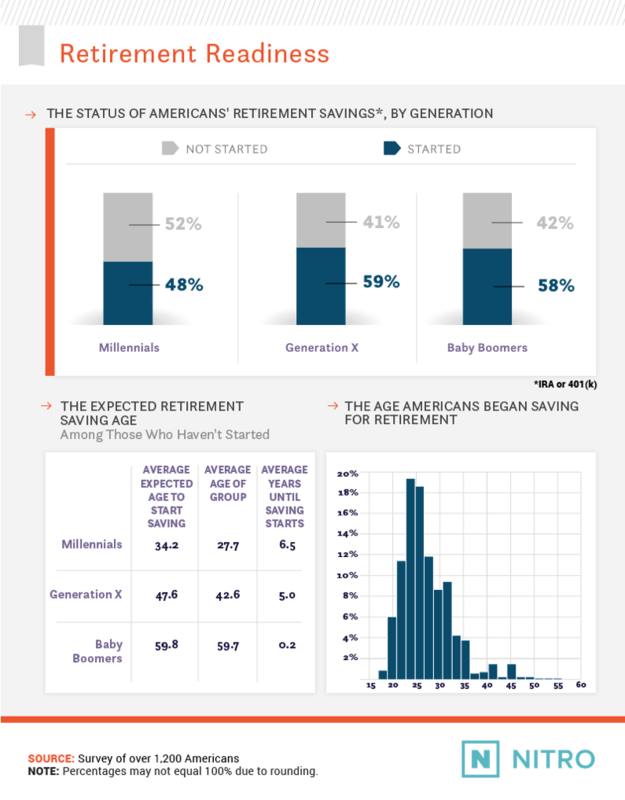 While millennials lagged a bit behind other generations when starting to save for retirement, the Gen Xers and baby boomers in our study were on roughly equal footing concerning retirement savings. That could spell trouble for older respondents, who won’t see their savings growing significantly through compounding interest if they retire a few years after starting to put money away. Perhaps that’s why baby boomers planned to start saving for retirement immediately. The average age of baby boomers who hadn’t started saving was 59.7 years old, and the average age at which they anticipated saving was 59.8 years. Conversely, the majority of those who had already started saving did so before age 30. That’s a positive sign for our respondents because even impressive contributions to retirement planning in later years can fall short of the value early savings provides. Millennials who hadn’t started saving yet aimed to begin at roughly age 34 on average, while Gen Xers planned to get started before they turn 48. But making retirement investments sooner is probably a better call in the long run, even if the contributions start small at first. While retirement savings didn’t have quite the emotional impact of the earlier events we considered, men and women reacted a bit differently to the prospect of putting money away for their later years. Among respondents who had started saving, women were more likely to express happiness, although men felt slightly more pride. On the other side of the spectrum, women who hadn’t started saving felt significantly more anxiety about it than men in the same boat. Similarly, men without savings felt anxiety about the prospect of retirement planning more often, although the largest percentage of these men expressed no emotional response at all. It’s safe to say they may feel differently as they get a bit closer to the end of their careers. While our results provide a compelling view of how most Americans’ financial lives play out, they don’t tell the most important story: your own. Whether these findings leave you feeling way ahead of the curve, solidly in the middle, or eager to make up for lost time, it’s important to remember you choose the terms of your financial future. This could mean saving certain choices for a later date or taking the plunge on a major purchase sooner than most. There’s no right or wrong way to save or spend, as long as you feel secure in your financial choices. That’s where Nitro can help. We provide the tools to achieve the lifestyle you need to feel successful. From basic budgeting strategies to complex lender comparisons, we’ll keep you informed about every subject that relates to your money. That means you can feel confident that you’re making progress – at any age. We surveyed over 1,200 Americans about their age and emotions at the time they experienced each of the financial events described above. We then averaged their results and segmented them by age and gender. If participants had not experienced a given event, they were not included in the average age calculation for that event. No statistical testing was performed, so the claims listed above are based on means alone. As such, this content is purely exploratory and future research should approach this topic in a more rigorous way. Want to share this project with your own audience? Feel free to use our findings and images for noncommercial purposes. We simply ask that you link to this page and attribute Nitro appropriately – giving credit where it’s due looks good at any age.